Go to the “SCHOLARSHIP ENTRY FORM” link on the bottom of this page to download the PDF application. 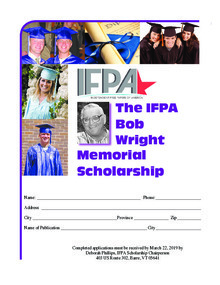 The Bob Wright Memorial Scholarship is presented annually in May by the Independent Free Papers of America. The number of scholarships will be decided at the January IFPA quarterly meeting according to the interest earned that year. The scholarship is based on need and merit. Each year the amount and number of the scholarships will vary depending on the foundations investment results. It is mandatory that, the fall semester immediately following selection, the scholarship award winners attend a college, university or school of their choice. The first disbursement must be made within twelve (12) months of selection. Money forfeited will return to the scholarship fund. 1. Applicant’s parent or legal guardian must work for a community paper that belongs to the Independent Free Papers of America. 2. Applicant must be a high school graduating senior or a current college student. 3. Applicant is not limited to attending a four-year college. Vocational schools, trade schools and community colleges are also accepted. 4. Applicant shall have manifested an interest in, or an understanding of, the free paper industry at the time of application. 5. Applicant shall have submitted an official Application of Scholarship, complete with all transcripts, recommendations and forms required, to the IFPA Scholarship Award Committee by March 22, 2019. IF NUMBER 6 (in total) IS OMITTED, APPLICANT WILL BE DISQUALIFIED. Please stress the importance of class ranking and grading system to your principal or superintendent as the IFPA Scholarship Committee needs this to fairly judge your application. 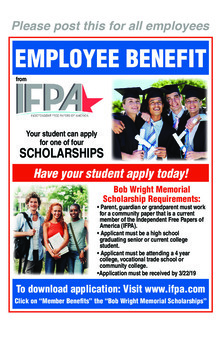 Please post this POSTER in your lunch room to let your employees know about this wonderful scholarship opportunity from IFPA. Or you can downlaod it and email to your employees!